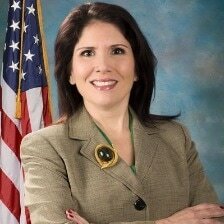 The Edwardsville/Glen Carbon Chamber of Commerce provided a 'meet & greet' opportunity for business leaders to speak with Illinois Lieutenant Governor Evelyn Sanguinetti Wednesday, April 27 at Stillwater Senior Living in Edwardsville. More than 50 Ed/Glen Chamber members attended this informal interaction with Lt. Gov. Sanguinetti. Lt. Gov. Sanguinetti enjoyed casual conversation with business leaders from Edwardsville/Glen Carbon. The brief presentation also included remarks from Lt. Gov. Policy Director Brian Costin and a legislative update from Illinois Chamber of Commerce VP of Advocacy Staci Wilson. Special thanks to Stillwater Senior Living for hosting the Edwardsville/Glen Carbon Chamber of Commerce and Lt. Gov. Sanguinetti at their beautiful facility.